A Martin Audio ML Compact loudspeaker system was installed as a key component in a significant upgrade of the technical capabilities at Sun Valley Community Church in Tempe, AZ. 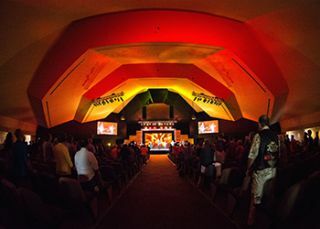 A view of the 1300-seat auditorium at Arizona-based church, Sun Valley Community Church. According to Eric Johnson, technical director for Sun Valley, “Sun Valley Tempe merged with Bethany Church two and a half years ago and we inherited a large campus and an auditorium with technical capabilities that were deficient by today’s standards. The audio system was old and primarily designed for natural speech, orchestra and choir reinforcement in an acoustic setting. That, plus the building is a complex geometrical design, basically a five-sided pentagon with a seven-sided auditorium that’s about 160 degrees wide, has a raked floor, many complex angles and no parallel surfaces. Needless to say, this presented a real challenge when it came to choosing a new loudspeaker system. Fortunately, Johnson was aware of the Martin Audio MLA system having first heard it several years ago during a demo at Comerica Theater in downtown Phoenix. The installed system for the 1300-seat auditorium consists of nine MLA Compact enclosures per side in left-right hangs with seven Martin Audio DSX subs in bunkers arranged in arc formation along the downstage edge. Two WT3 speakers for extreme left and right outfill and six DD6 speakers for front fill complete the system with Martin Audio MA3.0 and MA2.8Q amplifiers and a Merlin Processor that manages the outfills and front fills, as well as communications between the speakers. The rest of the setup currently includes a Soundcraft MH2 40-channel Desk at FOH Sennheiser Evolution Series wireless and DPA microphones. Johnson adds that the installation team, which included Ed Crippen from Clark, the system integration company, Jon Hunsacker and Kevin Hull from SVCC, and Sean Stinson’s ream of riggers from Clearwing, had to bring in a considerable amount of additional power to accommodate the new lights and audio system since the building was already over capacity for electrical service.